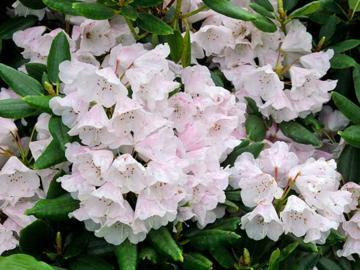 Medium to large evergreen shrub, usually smaller in cultivation than in the wild. Leathery green leaves with recorved edges.. Loose trusses of bell shaped flowers, white flushed with pale pink and with reddish spotting inside. Flowers quite early in the season. Moist, well drained humus rich acid soil. Foliage tends to become chlorotic on unsuitable soils. Native to the Anhwei (Anhui) province of eastern China, usually found on rocky hillsides and cliffs.